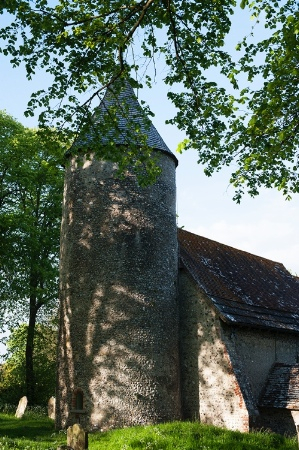 Southease Church has a round flint tower built in the first half of the 12th c. that houses a pair of bells of similar antiquity and importance. An inscription on the treble bell (Johannes Aleyn me Fecit) tells us John Aleyn cast it in 1296, in London. The other (tenor) bell has no inscription but is thought to have been made around 1260. The bells have one piece timber wheels for swing chiming and hang on a frame of unusual design with the main central post being an integral part of the spire roof structure. In 1996 the bells and frame were inspected and found to be sound, but the fittings showed signs of decay and corrosion and needed to be replaced. Following a fund raising drive the restoration was undertaken and completed in time for the millennium. The decayed 17c. fittings were renewed (the old ones are preserved as museum pieces) and the bells turned through 90 degrees to offer a fresh face to the cast iron clappers, believed to be original ones, and of unusual 'skittle' shape. The restored bells were returned to the tower at Southease in time to ring in the new millennium and they continue to be rung on the morning of the second and fourth Sundays of the month before the service of Holy Communion. 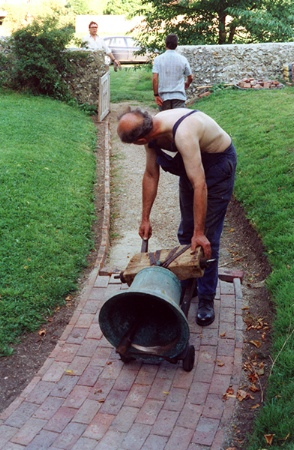 These ancient bells should now be good for another hundred years of ringing out over the village green.